In the third leg of a four-game homestand, the Denver Nuggets were once again faced with an opponent sitting at the top of its respective conference. The Toronto Raptors, leaders of the Eastern Conference by multiple games, were entering the final matchup of its own four-game road trip. On the extended stay away from home, the Raptors had already lost Jonas Valanciunas to a dislocated thumb and entered the matchup against the Nuggets without mainstays, Pascal Siakam and Kyle Lowry, with sixth man Fred VanVleet out as well. With both squads suffering from a number of injuries, the contest was marred with slumps from each team, with the Nuggets ultimately finishing on top due to a key run late. Out of the half, the Nuggets were staring at an 8-point deficit after a sloppy first two quarters of play. But, in front of the hometown crowd, the hosts were able to rattle off a 23-2 run to turn a 13-point Raptors’ lead on its head. In all, the Nuggets outscored the Raptors 38-16 down the final stretch of the 95-86 victory. Leading the way for the Nuggets once again was acclaimed big man Nikola Jokic. After posting 10 points and a trio of boards in the first half, the Serbian big man tallied 16 points and six rebounds in the second half alone. In the teams’ last four games, Jokic has tied or led the Nuggets in points, rebounds and assists in each. Adding to the contributions, in true ‘next man up’ fashion for the depleted Nuggets were both Monte Morris and Torrey Craig. Despite both players being relative afterthoughts after last season, the losses of Will Barton and Gary Harris early in the year have allowed the two to be thrust into key roles, with Morris manning the hole at sixth man. Thus far, Morris has averaged 13.5 points for the Nuggets over the last six games, with his 12-point effort Sunday serving as another boon for the teams’ bench production. The numbers on the night came from everywhere for Morris. Craig, after struggling in the starting lineup on the offensive end finally broke loose. The Nuggets newfound starting two-guard posted 13 points, with his pair of triples to begin the second half serving to keep his squad afloat. Coming into the game, the Raptors were missing the aforementioned Valanciunas along with the loss one of their breakout power forward Siakam due to repercussions from a nasty fall against the Portland Trail Blazers. 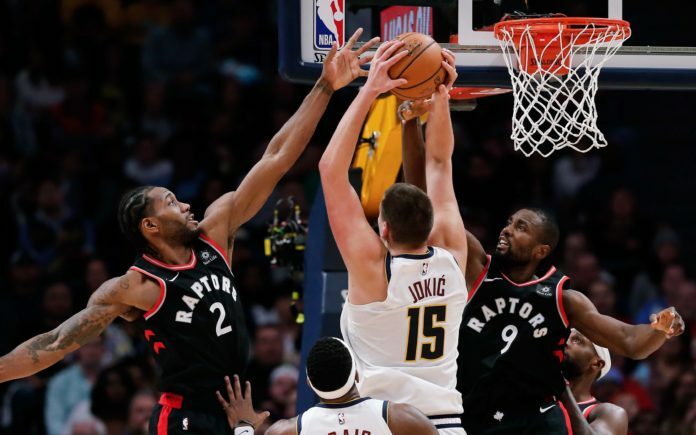 Despite missing two key contributors down low, the Raptors were still able to handle the Nuggets with relative ease on the glass and in the paint. In the game, the Nuggets were outrebounded 51-44 despite having both Plumlee and Jokic in the starting lineup. The thorn in the side of the Nuggets was mainly Kawhi Leonard, who despite averaging 6.2 boards per game prior to this year has become a rebounding force for the Raptors. In the game, Leonard racked up a game-high 14 rebounds to add to his career-high of 8.2 per game entering the contest. Leonard also served as the driving force for the Raptors’ attack down low with Delon Wright, who was filling in for the injured Kyle Lowry. The two combined for 44 points with only a single made 3-pointer between them. Wright, absent for much of the Raptors’ success this year, scored each of his six field goals in the paint. Clear lanes were found often for the 6-foot-5 guard. The rebounding prowess from the visitors was keyed once more by multiple tipped balls underneath the hoop. On several shot attempts, the Raptors served as benefactors to loose balls off the hands of both Jokic and Plumlee. Denver’s woes at the hands of a smaller Raptors lineup enabled the opposition to build a comfortable lead for much of the early going. For the Nuggets, the entire first half was one to forget. Not only did the team shoot 34.9 percent in the pair of periods, but the hosts’ starting five combined to make only 10-of-29 attempts (34.4 percent). Furthering the deficit was the Raptors’ 28-19 margin on the glass. With the loss of Harris and Barton, third-year guard Jamal Murray has been tasked with picking up the scoring load. A reliance on the former Kentucky Wildcat proved unfruitful for the Nuggets in the first half as he registered only three points and a +/- of -4. In the first three quarters altogether, that scoring total had only risen to four. If not for eight turnovers from the Raptors, the Nuggets were likely looking at a double-digit deficit going into the half against a team missing two of their three best players (Lowry and Siakam). Batted balls, bodies hitting the floor and diving into the crowd, the fight was there for the Nuggets. The execution is what lacked. Against full-strength clubs, the Nuggets are unlikely to overcome the mistakes that plagued them in the first half.